NIH Revisits Debate On Controversial Bird Flu Research : Shots - Health News On Tuesday, the National Institutes of Health in Maryland is holding a second day of talks about whether and how to continue funding some controversial scientific experiments. Back in January, virologists agreed to temporarily stop research that was creating new forms of bird flu, because critics argued that the work was too dangerous. A prefectural officer carries a chicken on a poultry farm on Oct. 15 on the outskirts of Kathmandu, Nepal, where chickens suspected of being infected with bird flu were found. On Tuesday, the National Institutes of Health in Maryland is holding a second day of talks about whether and how to continue funding some controversial scientific experiments. Back in January, virologists agreed to temporarily stop research that was creating new forms of bird flu because critics argued that the work was too dangerous. NIH officials are now seeking input from scientists and the public about how to proceed. Scientists, national security experts and public health workers have come from all over — including places like the United Kingdom, Hong Kong, Italy, Indonesia and Vietnam — to discuss thorny issues raised by the research. "The subject of this meeting literally affects every individual in the world," noted Harvey Fineberg, president of the Institute of Medicine of the National Academies, who is helping to run the conference. "Every citizen in every country has a stake in the research that will or will not go forward with respect to these highly pathogenic agents." These pathogenic agents are altered forms of the bird flu virus known as H5N1. 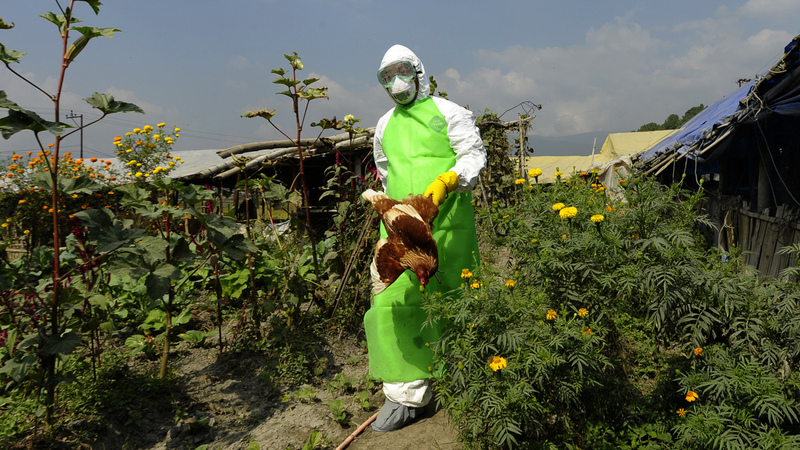 H5N1 is widespread in poultry in parts of Asia and the Middle East, but it rarely infects people. Over half of the people known to have gotten sick, however, have died. Public health experts worry that the virus might mutate, begin spreading from person to person and start a pandemic. Last year, NIH-funded researchers showed that certain genetic mutations could indeed make H5N1 spread easily between ferrets, the lab stand-in for people. When word got out that scientists had created these mutant viruses, there was an uproar. "There was an explosion of reaction, sometimes bordering on the very extreme," recalled Anthony Fauci, the director of the National Institute of Allergy and Infectious Diseases. One New York Times editorial called it "An Engineered Doomsday." So flu virologists around the world agreed to temporarily hold off on this kind of research. But some, like Ron Fouchier of Erasmus Medical Center in the Netherlands, thinks it's essential to get back to work. Fouchier says what is learned from this research could help public health experts do things like spot an emerging pandemic or develop vaccines. In his view, it's irresponsible to not follow up on his initial experiments. "All of this research is aimed to prevent flu pandemics or to mitigate their impact if they cannot be prevented altogether," Fouchier says. Others are not so convinced and say that if an engineered bird flu virus fell into the wrong hands or escaped the lab, it could kill millions. "Once novel flu gets going in the population, it's unlikely we could stop it," says Thomas Inglesby with the Center for Biosecurity at the University of Pittsburgh Medical Center. Inglesby thinks the moratorium should continue, but that if the NIH decides it will fund more research on altered forms of H5N1, everyone should acknowledge the risks. "I think we should also proceed in unprecedented biosafety conditions and with international agreements on how to proceed," he says. Officials have drafted a set of proposed criteria to help them decide whether and when to fund this kind of research in the future. For example, a proposed experiment would have to address a scientific question with high significance to public health, and there would have to be no feasible alternative methods to address the same question in a less-risky way. One of the reasons NIH is holding this conference is to see what people think of that proposed framework. This question of the moratorium can't be decided at this meeting because not all of the researchers who signed onto it are funded by NIH. But what the NIH says and does is influential, so what comes of this meeting and how it is incorporated into NIH decision-making could be important. On the agenda for Tuesday is a discussion of what kinds of lab safety measures should be in place to do this kind of work. Some experts say it should be restricted to the most secure labs possible. Others say that would needlessly slow down research that's vital for understanding the threat of naturally occurring flu pandemics. A video of the meeting will be posted online for those who could not attend, and NIH officials say they'll be accepting emailed comments on their proposed framework for decision-making until Jan. 10.